The author believes that equating "Muslim" with "Arab terrorist" is a limiting stereotype. He says that Muslim militants are a tiny faction denounced by most Muslims. Would that it were true. I have followed the rhetoric since September 11 and have not seen any denouncement of the Muslim suicide bombers or repudiation of the murders of women and children by the Muslim terrorists. What I have heard is feeble defense statements explaining how these heinous acts only go to show how disturbed the militant faction is that they have no recourse but to kill Americans and Jews. The author is just another of the Muslim apologists with statements like, "Militant Islamic groups, including Hamas, the followers of Osama bin Laden, and the Taliban draw on despair, while presenting their visions of a triumphal Islam that will protect their communities from the insidious attacks of the secular and satanic West." His final lament is, ". . . if we are going to prevent terrorism in the future we must seriously address the fundamental issues of world poverty and prejudice, inequality. . . ."
Why does he not condemn the militant members of this faith who disgraced it and all of humanity? The terrorists that destroyed the World Trade Center and their insidious leaders are not victims of poverty or inequality as he stated. They are evil, rich fascists who are trying to impose their will on the Western world by sneak attacks and murdering innocent civilians. I am proud that my country will stop at nothing to destroy them. Homerin responds: Like so many Americans, including me, Mr. Taback is right to bemoan the feeble response by some Arab and Muslim intellectuals to the tragedy of September 11. Sadly, such responses are too often the primary focus of the American news media. In Rochester, and other American communities with sizeable Muslim populations, Muslim condemnation of the attacks was swift and unequivocal. Perhaps Mr. Taback has forgotten that many Muslims, including some of those who died at the World Trade Center, are, like him, U.S. citizens. I also know for a fact that many Muslims throughout the world were horrified and sickened by these murders, which were committed in the name of Islam. Further, Mr. Taback calls Muslim militants "evil, rich fascists." This accurately describes Osama bin Laden and a handful of others, but even a cursory glance at the lives of the vast majority of the followers of Hamas and Taliban reveals lives of incredible material, psychological, and spiritual poverty. As for Mr. Taback's assertion: "The author is just another of the Muslim apologists. . . ." Perhaps this was said in anger; if so, I will try not to respond in kind. My comments appearing on page 5 of Rochester Review were adapted from a larger essay that may be found at www.rochester.edu/pr/Review/V64N2/homerin.html. Had Mr. Taback taken the time to read my entire essay he would have discovered that I am outspoken in my condemnation of religious militants of all kinds. More important, as I try to teach my students, to understand something is not the same as supporting it. But if we never understand the root causes of September 11, we will never move beyond the rhetoric to prevent such tragedies in the future. We are saddened to report that we have heard from another member of the University's alumni community who lost a loved one in last September's terrorist attacks [Winter 2002]. Robert Andrew Spencer, husband of Christine Hamwi Spencer '87, was killed during the attack on the World Trade Center. A foreign exchange broker for Cantor Fitzgerald on the 105th floor of the North Tower, Spencer-known to his family and friends as "Andy" and "Spence"-managed to leave a last message for his family, phoning to say, "I'm alive, and I love you." He leaves behind three children: Addison, 5, Kathryn, 3, and Robert, who was born August 16, 2001. The family held a joint service in late September to remember Spencer's life and to christen his month-old son. "I am proud to say Andy was my best friend," Christine says of the husband she first met eight years ago at the beach in Bay Head, New Jersey. "He was the perfect husband to me and an adoring father to Addie, Katie, and Robert. I realize how lucky I am to have experienced that kind of love." The Spencer family has set up a fund for Spencer's three children. A list of funds for family members of University alumni killed in the attacks is being maintained on Rochester Review's Web site at www.rochester.edu/pr/Review/ V64N2/memorials.html. An endowed scholarship has been established at the University in memory of Jeremy Glick '93, one of the passengers aboard United Flight 93 believed to have thwarted a fourth hijacking on September 11. The scholarship will support Glick's commitment to the value of a fraternity experience and its rewards. A member of Alpha Delta Phi, Glick served as chapter president in 1992-93. Contributions can be made to: Jeremy Glick Memorial Scholarship Fund, University of Rochester, Gift Office, 30 Wallis Hall, P.O. Box 270032, Rochester, NY 14627-0032. In our listing of the six alumni who died in last September's terrorist attacks [Winter 2002], we failed to note that Brendan Dolan '86 was senior vice president at Carr Futures, where he oversaw the firm's energy futures group. Regarding "Growing the Rochester Endowment," [Winter 2002] p. 14, paragraph 8: "When the University topped $1 billion in 1998, it was one of only 34 colleges or universities in the seven-figure club." I have one minor comment: $1 billion = $1,000,000,000 (ten figures). $1 million = $1,000,000 (seven figures). Otherwise, I found the article fascinating and enlightening. Thanks for the correction (and the refresher course in the base 10 numbering system)-Editor. The photo on page 25 [Winter 2002] shows my classmates, Class of '52, at Frosh Camp. I believe that's Sydney McCandless '51 singing out in center front. 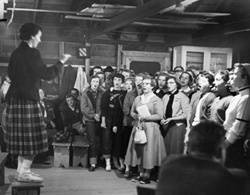 I see [the late] Lydia Test [Cook] '52 to the right of the conductor and one of the Ingebretsen twins-[Anne Ingebretsen Johnston '51 and Hilda Ingebretsen Miller '51]-next to her. Since we entered in 1948, this photo could be dated any of the four years after that, but not 1954. It's probably 1950. That year, my grandfather died while I was at Frosh Camp, and I had to leave unexpectedly, getting to a train station by bus so that I could get to New York for the funeral. Frosh Camp was a fabulous experience, and I hated to miss even a few days. We appreciate the help in better dating the photograph and in identifying the participants. Thanks, too, for sharing your memories-Editor. Compliments on the Winter 2002 issue. It caught my attention immediately with the article on Alzheimer's disease, the article on [Tony Award-winning orchestrator] Douglas Besterman '85, and the Meliora Weekend section. The weekend was a grand event. I am pleased that I was there. I am writing to honor the life of a Rochester alumnus and to share a connection that exists between two generations of Rochester students. Don Gardner, a member of Rochester's Class of '57, passed away last year after a battle with cancer. With his passing, Mary Ann and Jace Gardner lost a devoted husband and father. My dad lost his best friend; and I, along with several of my friends from Rochester's Class of '89, lost a teacher, a role model, and a friend. Don Gardner and my father, John Murphy, first befriended one another as young teachers, fresh out of college and the Navy, at Rochester's West High School in the early '60s. Their friendship evolved as they pursued different paths within the education field, and each eventually ended up in the Albany, New York, area. As my brothers and I grew up, Mr. Gardner-along with his family-was always an important part of our lives. He patiently taught all of the Murphys to ski. He attended weddings and camping trips, and he followed our progress in school and in life as if we were his own sons. 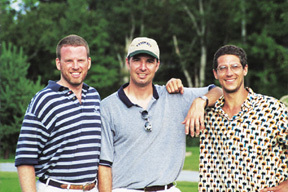 Tony Vengrove '90, Tim Murphy '89, and A. C. White '89 (left to right) at the first Don Gardner Golf Classic. The event will become an annual event to raise money for the American Cancer Society in memory of Gardner '57. When I expressed interest in attending Rochester, Mr. Gardner embraced the prospect with passion. He wrote me a glowing recommendation, offered his assistance in any way possible, and truly enjoyed the notion that I would be attending his alma mater. When he and Mary Ann attended Parents Weekend with my mom and dad during my junior year, I was not sure who was more proud-Mr. Gardner or my own parents. Mr. Gardner and I developed a certain kinship through our shared experience, which spread to several of my friends from Rochester as they met him. He was a regular fixture with my dad, my brother, and my friends on the golf course and on the ski slopes, and, despite the rather sizeable gap in our ages, the mood was always one of camaraderie and conviviality. Don Gardner enjoyed the simple pleasures of life: the love of family, the company of friends, a smooth run on the ski slopes, and a good round of golf. When he passed away, my father chose to honor him the best way he knew how-by bringing his family and friends together to play in a golf tournament in his name. I was especially pleased with the number of my contemporaries-two generations removed from Mr. Gardner and my father-who wanted to come out to enjoy the day in his memory. We have decided to make the Don Gardner Golf Classic an annual event in the Albany area, and we welcome the participation of any of Mr. Gardner's friends from his Rochester days at this year's tournament on August 3. Any interested classmates can contact John Murphy at (518) 477-1058. Proceeds from the event benefit the American Cancer Society. reveal themselves until years after graduation. My experience at Rochester allowed me to connect with a man who would teach me about dignity, humility, laughter, and the love of friends and family. In a story on the 40th anniversary of the Plutzik Memorial Poetry Series [Winter 2002], Rochester Review misidentified the sponsor for the series. The series, which honors the life and poetic career of the late Hyam Plutzik, professor of English, is administered by the Department of English-Editor.